This weekend is a good time to check if your bees are alive. Go out in the warmest part of day. The bees may be going on cleansing flights so it may be obvious there is bee activity. You can also rap on the side of the hive and listen for the buzz of the cluster. If colonies were very heavy with honey going into winter. Sometimes the bees have not moved up yet. The bees in this situation may not go on cleansing flights if they are still deep in the hive. 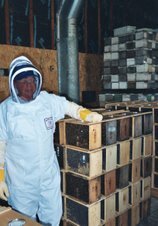 A beekeepers may think the colony is dead but they may be alive and well. If your hive fits this description, rap on the hive in the lower box as well and listen. Always wear a veil when out with the bees. They may be chilly, but they can still put the hurt on you.